As ranking Confederate field officer, Joseph E. Johnston gets credit for the South�s first victory at Bull Run. Some scholars consider him �the South�s greatest strategist.� Union commander, U.S. Grant said, �General Johnston was the ablest of Confederate Generals.� ■ Joseph Eggleston Johnston was born February 3, 1807, at Farmville, Virginia. His grandfather, Peter Johnston, emigrated from Scotland to Virginia in 1727. His mother was Mary Wood, a niece of Patrick Henry, whose father John Henry was born in Aberdeen. Johnston was graduated from West Point in 1828. He was wounded and cited for bravery in the Indian and Mexican Wars. ■ As a top Confederate officer, Johnston reasoned early that in view of the overwhelming superiority of the North in firepower, manpower and industrial might, his best course was to follow the strategy of Fabianism. Named for the Roman general Fabius Maximus, this calls for delay, retreat, harassment, and counterattack. ■ The strategy was used effectively as Johnston retreated to Atlanta before the armies of General Sherman. In the last desperate days, Johnston never panicked in spite of the rapid deterioration of his position. 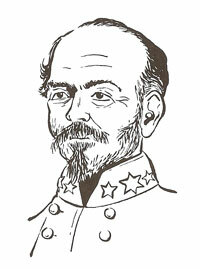 The Encyclopedia Britannica said, "Johnston's strategy was generally sound and more advanced in design than that of most Confederate generals." ■ Highly critical of General Johnston, President Jefferson Davis insisted that he stand fast and slug it out. Johnston considered that suicidal and refused. Davis replaced him with General Hood, who stood fast in three battles. He lost all three. Hood's army was destroyed. ■ Johnston served in Congress, engaged in business, and wrote his memoirs. He died March 21, 1891, in Washington, D.C., loved and respected by the South as "Old Joe."